Thermoplastic single-ply roofing membranes are among the fastest growing commercial roofing products and have gained broad industry acceptance for their many performance and installation advantages. TPO is short for Thermo-Plastic Olephine and is quickly becoming the standard for low slope roofing applications. TPO is a highly reflective and durable single ply membrane. What makes TPO great is its' ease of installation and it's heat welded seams. Hot air, forced from electric heaters, are used to fuse flashings and seams. 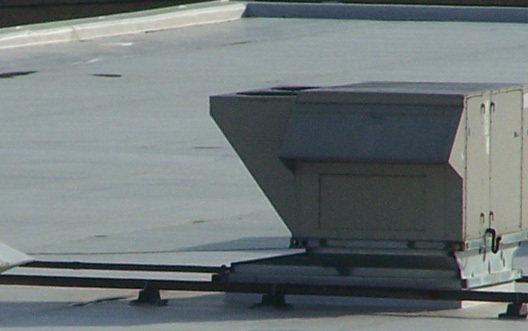 In addition TPO is available in rolls larger than more traditional roofing systems meaning less seams. Less seams means less chance for failure. TPO is and excellent choice where minor ponding water may exist due to it's excellent lack of water permeability. While TPO is available in multiple colors, it's most common is white. A White TPO roof is a highly reflective and is a cool roof,exceeding current energy efficiency standards and is an US Department of Energy, Energy Star rated roofing system. TPO may qualify for tax credits and LEED points. TPO is truly a "green roof". TPO is commonly installed mechanically fastened or fully adhered. Due to its' lightweight nature it can often times be installed over existing roofing systems (when code allows). TPO is available in thickness ranging from 45 mils up to 80 mills. As you can imagine the thicker TPO will be more durable, last longer, is able to be warranted for longer terms, but also does require more up front investment.